The Sixty-Second Ohio Volunteer Infantry of the 10th, 18th, and 24th Army Corps, Proceedings of the Re-Union of 1885, Held at Zanesville, O., September 10 and 11, and a Directory of the Surviving Members. Organized at Camp Goddard, November 18, 1861, Mustered Out at City Point, Virginia, December 7, 1865 . 12 pgs. NP. ND. Organized in November, 1861, under Colonel F.B. Pond, it went to the field in January, 1862, reporting to General Lander near Cumberland, Md. It operated in the Shenandoah Valley, participating in the battle at Winchester under General Shields, and in August joined McClellan's Peninsula campaign. In January, 1863, the Regiment moved to North Carolina and thence to Port Royal, South Carolina. In July it participated in the assault upon Fort Wagner, losing one hundred and fifty men, and again took part in the siege of Charleston. During the whole year, 1864, the Regiment was actively engaged with the army about Richmond, and in the spring of 1865 took part in the assault upon Petersburg and the victory at Appomattox. In September, 1865, it was consolidated with the 67th Ohio and thereafter lost its identity. 62nd Regiment Infantry. Organized at Zanesville, McConnellsville and Somerton, Ohio, September 17 to December 24, 1861. Left State for Cumberland, Md., January 17, 1862, thence moved to Paw Paw Tunnel February 3. Attached to 2nd Brigade, Landers' Division, Army of the Potomac, to March, 1862. 2nd Brigade, Shields' Division, Banks' 5th Army Corps, and Dept. of the Shenandoah, to May, 1862. 2nd Brigade, Shields' Division, Dept. of the Rappahannock, to July, 1862. 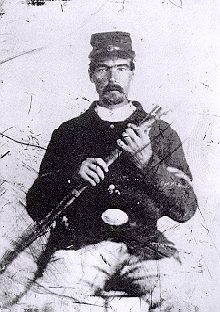 3rd Brigade, 2nd Division, 4th Army Corps, Army of the Potomac, to September, 1862. Ferry's Brigade, Division at Suffolk, Va., 7th Army Corps, Dept. of Virginia, to January, 1863. 1st Brigade, 3rd Division, 18th Army Corps, Dept. of North Carolina, to February, 1863. 3rd Brigade, 2nd Division, 18th Army Corps, Dept. of the South, to April, 1863. United States forces, Folly Island, S.C., 10th Army Corps, Dept. of the South, to June, 1863. 1st Brigade, Folly Island, S.C., 10th Army Corps, to July, 1863. 1st Brigade, 2nd Division, 10th Army Corps, Morris Island, S.C., July, 1863. 2nd Brigade, Morris Island, S.C., 10th Army Corps, to October, 1863. Howell's Brigade, Gordon's Division, Folly Island, S.C., 10th Army Corps, to December, 1863. District Hilton Head, S.C., 10th Army Corps, to April, 1864. 1st Brigade, 1st Division, 10th Army Corps, Army of the James, Dept. of Virginia and North Carolina, to December, 1864. 1st Brigade, 1st Division, 24th Army Corps, to September, 1865. SERVICE.--Duty at Paw Paw Tunnel and Great Cacapon Creek till March 10, 1862. Advance on Winchester, Va., March 10-15. Reconnoissance to Strasburg March 18-21. Battle of Winchester March 22-23. Mt. Jackson March 25. Strasburg March 27. Woodstock April 1. Edenburg April 2. Expedition to Harrisonburg May 2-4. March to Fredericksburg, Va., May 12-22. Great Cross Roads May 11. March to Front Royal May 25-30. Port Republic June 5. Battle of Port Republic June 9 (cover retreat). Ordered to the Peninsula, Va., June 29. Harrison's Landing July 3-4. At Harrison's Landing till August 16. Movement to Fortress Monroe August 16-23, thence moved to Suffolk, Va., and duty there till December 31. Action on the Blackwater October 25. Expedition from Suffolk December 1-3. Action near Franklin on Blackwater December 2. Zuni December 12. Moved to Norfolk, Va., December 31, thence to Beaufort and New Berne, N. C., January 4, 1863. Moved to Port Royal, S.C., January 25. At St. Helena Island, S. C., till April. Occupation of Folly Island, S.C., April 3 to July 10. Skirmish at Folly Island April 7. Attack on Morris Island, S. C., July 10. Assaults on Fort Wagner, Morris Island, July 11 and 18. Siege operations against Fort Wagner, Morris Island, and against Fort Sumter and Charleston, July 10-September 7. Capture of Forts Wagner and Gregg, Morris Island, September 7. Operations against Charleston till October 31. Moved to Hilton Head, S.C., November 7, and duty there till April, 1864. Regiment reenlisted January 3, 1864. Moved to Yorktown, Va., April. Butler's operations on south side of the James River against Petersburg and Richmond May 4-28. Capture of Bermuda Hundred and City Point May 5. Swift Creek May 9-10. Operations against Fort Darling May 12-16. Battle of Drury's Bluff May 14-16. Bermuda Hundred front May 16-30. Ware Bottom Church May 20. Port Walthal and on the Bermuda Hundred front June 16-17. Siege operations against Petersburg and Richmond june 16, 1864, to April 2, 1865. Demonstration north of the James at Deep Bottom, August 13-20, 1864. Strawberry Plains August 14-18. New Market Heights, Chaffin's Farm, September 29-October 1. Darbytown Road October 7 and 13. Battle of Fair Oaks October 27-28. Duty in trenches north of the James before Richmond Hill March, 1865. Moved to Hatcher's Run March 27-28. Appomattox Campaign March 28-April 9. Fall of Petersburg April 2. Pursuit of Lee April 3-9. Rice's Station April 6. Appomattox Court House April 9. Surrender of Lee and his army. Garrison and guard duty in District of South Anna, Dept. of Virginia, till September. Consolidated with 67th Ohio Infantry September 1, 1865. Mustered out December 7, 1865. Regiment lost during service 11 Officers and 102 Enlisted men killed and mortally wounded and 2 Officers and 129 Enlisted men by disease. Total 244.